“Whether you love it or loathe it, whether it excites you or terrifies you, artificial intelligence (AI) is here and surreptitiously integrated in most things digital. The concept is far from easy to grasp: there is apparent confusion over what constitutes AI and the meaning of closely related concepts such as machine learning or deep learning. There is also a definite divide between those who swear by AI and those who relate to it as “accelerated human simulation” as the data being fed into the models is man-made. It is nevertheless obvious that AI is quickly becoming essential in a wide variety of digital applications. In South Korea, a group of very active and respected companies have developed applications to address national defence by consolidating 700 million daily dataset samples from news feeds and social media around the world. Using AI, this data is analysed to assess risk and create a heat map of active threats to the country. This technology can also be applied in a commercial context, for example to understand consumer emotion following an issue such as a product recall or technical incident. Another field when AI is increasingly present is education. When we attended the 2018 Corporate Innovation Forum in another AI hotspot, San Francisco, Abraham Kang, Head of AI at Samsung Research America, pointed out that in order to keep up with the exponential acceleration of technology development, we need to considerably increase our ability to absorb information. Personally, he achieves this by watching education videos at 2.5x speed (any higher and the voice is too squeaky)! In order to keep up with the exponential acceleration of technology development, we need to considerably increase our ability to absorb information. Globally, AI is increasingly addressing the education market to provide autonomous interactive learning. An example of this is the integration of a “Robo-Teacher” in smart speakers such as Amazon Echo or Google Home. In the scenario of learning a language, the Robo-Teacher can analyse and correct both grammar and pronunciation negating the need for the student to be in class and giving the freedom to advance, or not, at their own speed. Toronto, Canada is currently emerging as a hub for AI. It can be discussed whether this development is mainly due to specialists from the region itself or the result of talent migration from Silicon Valley and elsewhere. There is a general feeling of unrest coming from Silicon Valley due to explosions in salary and real estate costs leading to talent looking elsewhere. 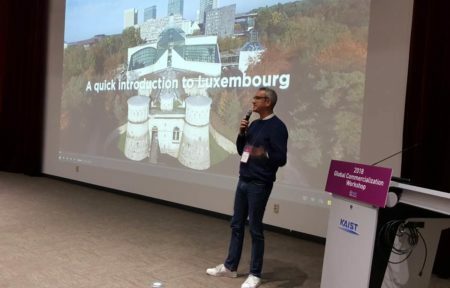 Luxembourg positions itself well with regards to AI with the on-going project to acquire High Performance Computing capacities, the research conducted by the Interdisciplinary Centre for Security, Reliability and Trust (SnT) of the University of Luxembourg and the presence of AI specialist NVidia which increase our visibility in this market. According to Professor Jin Hyung Kim, CEO of the Open Data Strategy Council at the Artificial Intelligence Research Institute of Korea, there are no more than 20,000 “AI gurus” globally, which will limit the number of centres of excellence that can be developed around the world. Luxembourg aims to be present in the count. Luxembourg is certainly interesting for companies for many reasons, not least due to the fact that the country is an excellent launch pad for businesses targeting the whole European market. Many Russian companies are actively looking to enter the European market and following the trade mission to Moscow last October, Luxembourg is clearly on the map for many valid reasons. Artec 3D, a 3D scanning solution, came to Luxembourg a few years ago to enter the European market and to eradicate logistical issues they faced in their supply chain. Since the partnership was set up, we have welcomed companies to Luxembourg active in biomechanics, advanced 3D printing and space technologies. In 2018, Luxinnovation became a partner of the Skolkovo Foundation in Moscow, which hosts over 1,700 start-ups at various stages and covering all possible verticals and technologies. Since the partnership was set up, we have welcomed companies to Luxembourg active in biomechanics, advanced 3D printing and space technologies. Innovative companies located in dynamic AI and digital hubs can generally benefit from the support of a host of incubator, accelerators and other similar initiatives. Another trend spotted during the year is that some locations have added a new dimension to this support with the key ingredient being collaboration and complementarity of different initiatives. Respected incubators and accelerators in Canada such as OneEleven, DMZ or MaRS run programmes that are complimentary, allowing tenants to evolve from one to the other as their maturity and needs develop. The Luxembourg state visit to Paris in May 2018 took in a visit to Station-F, the biggest start-up campus in the world. Station-F counts on the support of technology multinationals such as Microsoft, AWS and Google to provide guidance to their members, again showing that collaboration is the byword for success. Providing an environment that lends itself to innovation has been key over the years in Luxembourg as well, leading to the creation of the House of Startups in 2018. The organisation provides this element and brings together innovators from different sectors to exchange and grow.